He's throwing again. And running too. But that doesn't make Doug Pederson any more confident that Eagles quarterback Carson Wentz will be healthy come Week 1. As Rookie Mini Camp kicked off in South Philly Friday, Pederson was very, very cautious in his optimism about Wentz' recovery and return to the field after getting ACL surgery last December. “I am highly encouraged with where he's at right now," the coach said. "He's making progress each day. … it’s a fine line too — this time of year of maybe trying to do too much too soon. But our guys are on top of it." 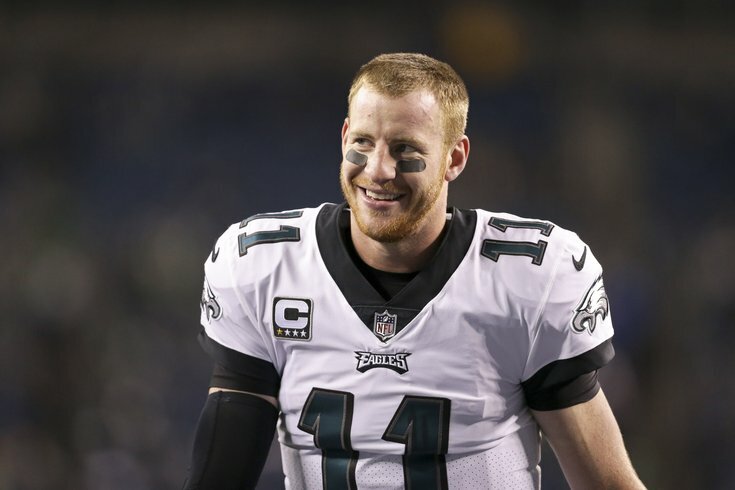 Wentz' recovery timeframe sees him back on the field late August or early September, if he can make it on the short side of the 8-to-10 month recovery scale. But that would have him just starting to practice fully as the Eagles break training camp. Wentz has said, repeatedly, that he intends to be ready for Week 1 but the Eagles are hedging their bets. Extending Nick Foles, the Super Bowl MVP assure some very talented insurance waits in the wings. “I love the enthusiasm," Pederson said. "I want it from all of our players. So back to Sidney Jones, I'm not going to rush him out there I don’t want to expose him. He will be ready when he's ready." Last year Jones, who was drafted after ankle surgery, missed the first 16 weeks of the season before playing in Week 17. A franchise quarterback is different than a second round cornerback. And a full-fledged quarterback controversy could mar the Eagles' Super Bowl repetition attempt should Foles start the first few weeks of 2018 and play exceptionally well. “It is a different situation but Big V played extremely well in Jason Peters absence,” Pederson said, turning the attention once again to some of the other recovering Eagles' stars. “All the guys, Jason Peters is confident, Darren Sproles is confident. But I am not going to further risk any other setbacks." "It goes back to me protecting the starters a little bit, you know Alshon [Jeffery]'s situation," Pederson said, alluding to offseason surgery the Eagles' top wide receiver recently underwent. "Having depth at that position helps us down the road, guys like Markus [Wheaton] and Richard [Rodgers] are veteran players who give us more depth and competition and make us better." The Birds added depth at quarterback too, adding Joe Callahan to the fold. The team as a whole has a renewed motivation this season despite being reigning world champs. Some future hall of famers and Pro Bowlers were unable to participate in the 41-33 win over the Patriots back in February. “That’s a tribute to Carson and really all the injured guys — if you watch these guys work, I am hoping the rest of the team sees it and works on it," Pederson said. "For me as a coach, not to have those guys there at the end of the season that motivation for us to get off our tails for them." How Pederson and the Eagles handle their returning injured stars could be the most important early chapter of the 2018 season. Stay tuned.